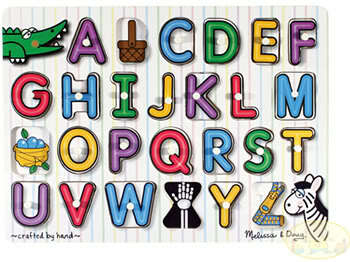 Our newest treasure is a Melissa & Doug wooden ABC puzzle from Gummy Lump Toys! And the best news? You can win your own choice of wood puzzle from GummyLump.com! Gummy Lump Toys is one of those wonderful online toy companies that carries only toys you'd be proud to have your children own. The toys are creative and educational and multi-purpose to spark kids' imaginations. They tend to be made from natural and durable materials, mostly wood, and they're the type of toys that win awards for excellence. So when Gummy Lump wrote me and offered me a Melissa & Doug wooden puzzle to review, I jumped at the chance. I have other Melissa & Doug puzzles so knew it was just a matter of choosing the right one to keep Mikko amused. Boy howdy, did I choose right! Witness the ABC Peg Puzzle! N.B. This puzzle has delightful little pegs. Intended for ages 2 years and up, this sturdily built wooden puzzle features nice little pegs that little fingers can grab. The images on the pieces are the letters of the alphabet, and underneath — surprise! — there's a corresponding picture that starts with each letter. 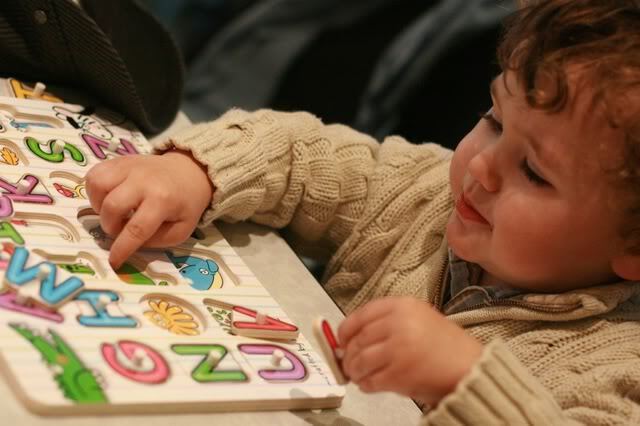 The puzzle builds matching, reading, memory, and manual dexterity skills. That's just from my observations alone! You get to hear him want to eat all the food pictures in the puzzle. It seems all virtuous until he clarifies that he wants a Schokolade (chocolate) egg, not one of those regular nutritious ones. You also get to hear him exclaim with unfeigned delight over a W that's actually an M, but who can correct him when he's being such an adora-toddler? Chubby starfish hands grasp pegs with ease! I think that should be their advertising copy, don't you? This is one of those puzzles where the parent feels good because it seems all educational and stuff, and the child feels good because he has no idea he's Learning Something Useful. Is there anything I would change about the puzzle? Well, there's nothing I can't live with. Some of the letters fit a little loosely, so sometimes Mikko thinks a piece is in the wrong space or turned the wrong way when it's not. Some of the images they chose are a little obscure, but that's actually turned out fine, since it's taught Mikko new vocabulary ("jump rope," for instance). The images have to fit within the confines of the letter shape, so some letters were probably easier to match words to than others. As far as my experience with Gummy Lump Toys, I have nothing but good to say about their fabulous response and shipping times and the great shape the puzzle came in. I even appreciate their story of why they're called Gummy Lump. We've really been enjoying playing with this puzzle at home and on the go. It's the kind of activity that can entertain a toddler while adults have some conversation time. (No, really! Actual conversation!) The only downside is that the pieces of course end up in a big pile in your bag. Does anyone have a solution to this? One of my favorite Melissa & Doug items is actually their travel puzzle sets for easy transport reasons. And, there are some puzzle storage solutions for keeping puzzles organized at home or school, but what do you do when you travel with puzzles? Seriously, if you leave a good solution, I'll give you an extra entry! Can you hear him saying "P" for "pear"? Gummy Lump Toys wants to offer you the chance to win your very own wood puzzle, up to $12. You can choose based on the age and interest of your own kidlet(s). 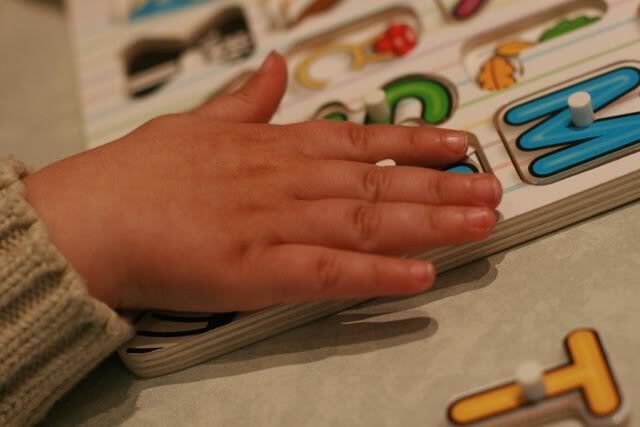 For babies, there are jumbo knob puzzles that are perfect for palm grasping. For toddlers, there are chunky puzzles where the pieces can actually stand up and be played with as little figures! For sensory fun, I've gotta say I love the idea of these touch-and-feel puzzles. 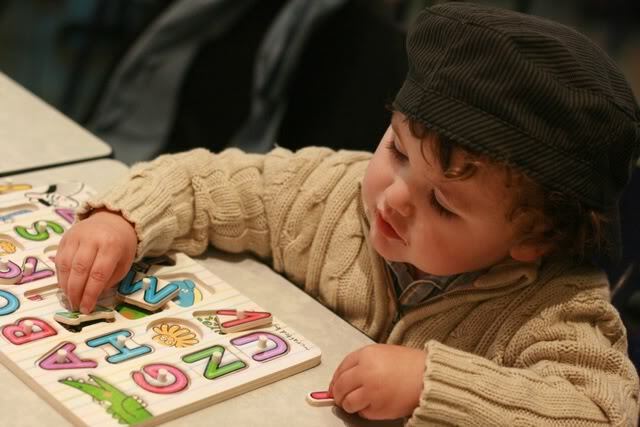 For preschoolers figuring out emotions and storytelling, there are dress-up puzzles. For kids like Mikko who love surprises hidden under pieces, there are hide-and-seek puzzles. Kids who like making silly pictures would enjoy these mix-and-match peg puzzles. 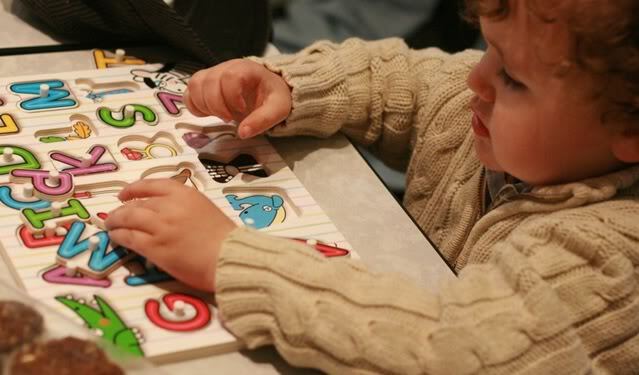 For older kids (3 years old on up), there are wooden jigsaw puzzles with 12, 24, or 48 pieces. And, not even joking, they have puzzles that play a matching sound when the piece is fit into the right slot. That's right: The hard part is picking your favorite! You can find ours and similar wood puzzles at GummyLump.com for very reasonable prices or on Amazon! For instance, the Melissa & Doug ABC Peg Puzzle I received is currently on sale for only $6.39, and there's a whole (jam-packed!) category of toys under $10. Besides puzzles, Gummy Lump Toys carries all sorts of quality creative and educational toys from respected companies like Melissa & Doug, Guidecraft, Haba, KidKraft, Citiblocs, and more! You can shop by age, category, or brand. The fact that they've subdivided their site into so many helpful categories makes it really easy to find something that suits your kids or a gift recipient. Gummy Lump offers free U.S. shipping on orders over $75. For your own chance to win a wood puzzle from Gummy Lump Toys, up to $12 in current price, enter in the comments below! Contest is open to U.S. only (sorry, my dear international friends — you know I would mail to you if I were doing the mailing). MAIN ENTRY: Head on over to GummyLump.com and tell me what glorious wooden puzzle (up to $12) you would choose! Tell me what lovely little one(s) will enjoy this puzzle if you win! Tell me what kind of puzzle your little puzzler(s) would prefer (you can see my list above for types such as jumbo knob, chunky, peg, jigsaw, etc.). Poke around GummyLump.com and tell me what other toy catches your eye! Follow or subscribe to the Gummy Lump blog. Follow @GummyLump on Twitter and leave your Twitter name in the comment. It is entirely possible to wear a kicky hat while completing your puzzle. Become a fan of Gummy Lump on Facebook. Become a fan of Hobo Mama on Facebook. Enter another of my current giveaways (1 extra entry per giveaway). Do something lovely for this post, a post on the Gummy Lump blog, or a post on Hobo Mama (StumbleUpon, Twitter, Facebook, Digg, etc.) and let me know what it was and which post in your comment. There is a Share button below each post on Hobo Mama. You can gain 1 extra entry per share, up to 3 extra entries total. Fave me on Technorati and leave your user name. Contest open to U.S. ADDRESSES ONLY. (Sorry, everyone else!) Shipping is by UPS, so a street address is required (no P.O. Boxes). Contest closes May 12 at 11:59 p.m. PST. for my review but no other compensation. I love the kicky hat! So cute. I also love the Sea Life chunky puzzle, and I think my daughter would too. Thanks! Oh, this would be for my daughter. And any of her little friends who came over too. I think my daughter would like the chunky puzzles and the textured sensory ones best. It was actually hard to choose a favorite between them. I also like the Haba Land of Dragons blocks from the Gummy Lump site. I like the ABC Peg Puzzle by Melissa & Doug. I like the Sea Life Chunky Puzzle by Melissa and Doug . So cute! I love Melissa & Doug. I also love this website! I love wooden toys. The stacking blocks are great. All of the puzzles. I REALLY Like the Latches Board. I also like all the food toys. My son is 13 months, I'm sure he would love to chew on any one of the above mentioned. I would pick the Animals Mini-Puzzle Pack by Melissa & Doug. Since my daughter is only 1, I think she would prefer the chunky puzzles. That's why I picked out one with the larger pieces so she could grab them easily. I also like the red & blue Citiblocs set. I would choose the ABC Peg puzzle too! I've seen it before and have thought about getting it! My son would be the recipient of this puzzle. He would love it. His favorite type of puzzle is a hide-and-seek puzzle. Certain magnets belong behind certain doors. He can't get enough! My son would love the Fire Truck Sound Peg Puzzle by Melissa & Doug. My son would love this puzzle. My son likes chunky puzzles. I like the Bugs Chunky Puzzle by Melissa and Doug. If I win, my wonderful daughter will enjoy this! I think my daughter would like the hide-and-seek puzzles as well. I subscribe to the Gummy Lump blog. I love the Band in a Box by Melissa & Doug. I'm a facebook fan of Hobo Mama under username Jennie Tilson. I'm a facebook fan of Gummy Lump under username Jennie Tilson. I really like the Bugs Chunky Puzzle! My 2 year old son would love this puzzle! OMG the 3-D Dinner Puzzle Play Food by Guidecraft is too cool! It's 2 toys in one, I love it! Sidney would love to work the puzzle. Sidney would like the puzzles that play a matching sound when the piece is fit into the right slot. I like the Grocery Store & Lemonade Stand by Melissa and Doug. This would challenge the kids to use their imaginations. We'd love the Zoo Animals Touch and Feel Puzzle, or the Zoo Animals Sound Puzzle. I'd choose the Fish Colors Mix & Match puzzle. i love the farm animals jumbo! I like the 48pc Pirate Jigsaw Puzzle! It's hard to pick just one, but I really like the ABC Peg Puzzle, too! My nieces (ages 3 and 18 months) will enjoy this puzzle if I win! My children (who are older than my nieces) would prefer a jigsaw puzzle. I follow you (HoboMamaReviews) publicly through Google Friend Connect. Another toy at GummyLump that catches my eye is the Multi-level solid wood dollhouse (by Melissa & Doug). I follow GummyLump on Twitter (HSBSuzanne). My StumbleUpon username is HSBSuzanne. I'm subscribed to HoboMamaReviews via Google Reader. i'd like the chunky shapes puzzle. this would be for my toddler, q.
we're moving on to peg puzzles. i also like the m & d wooden play cxookie set- cute! i entered the breast pump giveaway. I'd like to win the Shapes Chunky Puzzle. If I win, this puzzle will be for my daughter. I think the chunky puzzles would be best for my daughter. I also like the Educo Alphabet Abacus from Hape. African Plains puzzle!! She would love it. Baby girl Quinn would enjoy these puzzles, of course! she'd love the chunky puzzles! 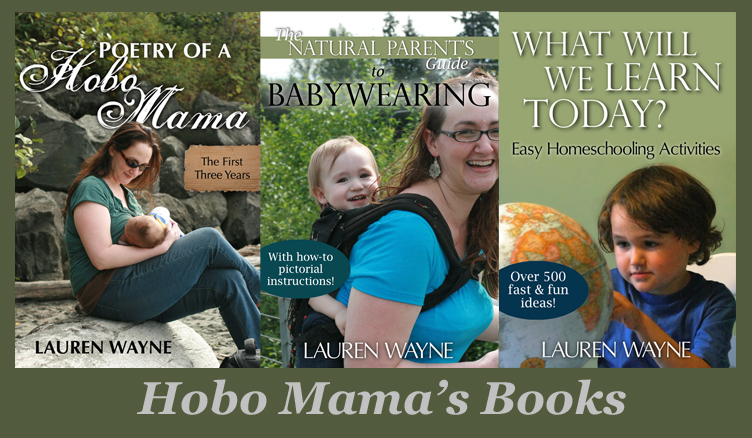 like hobo mama on facebook!! My daughter as well as my day care kids would love this! My three boys will enjoy this puzzle! I would choose the 24 piece prehistoric sunset wooden puzzle by Melissa and Doug. this would be for my little man, Maddox. At this age, chunky would be best for him! I also like the guidecraft breakfast puzzle play set. My son would have a lot of fun with the 24 pc African Plains Wooden puzzle. My 2-year-old would be the happy recipient of this puzzle. My son is currently mastering 12 pc. puzzle, so is ready for 24 pc jigsaw puzzles. I also like the 100pc colored wooden building blocks by Melissa & Doug.